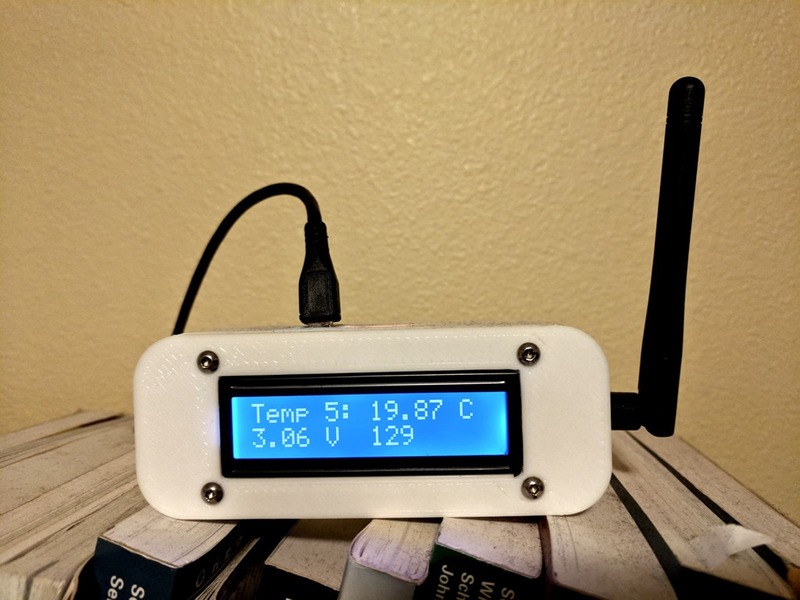 Someone recently contacted me about this project and asked for more details about the base station that collects data from the remote sensors. I didn’t bother to create a proper PCB for that part of the project, instead just soldering something together with perfboard, but I’m happy to share pictures and details about what I did. The base station sits on top of a bookshelf, out of the way. It’s powered from a USB adapter and all of my sensors are close enough that reception isn’t a problem. 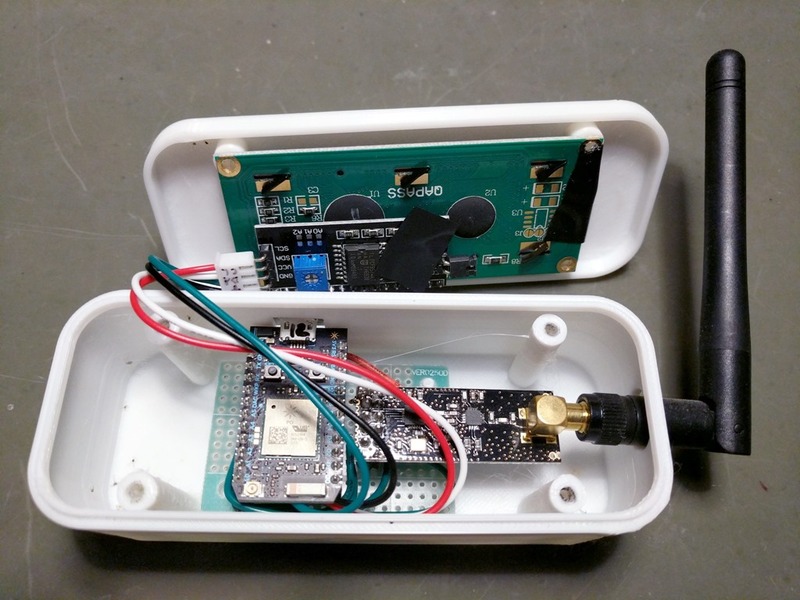 I chose to use a nRF24L01+ radio that has an SMA antenna for greater range. 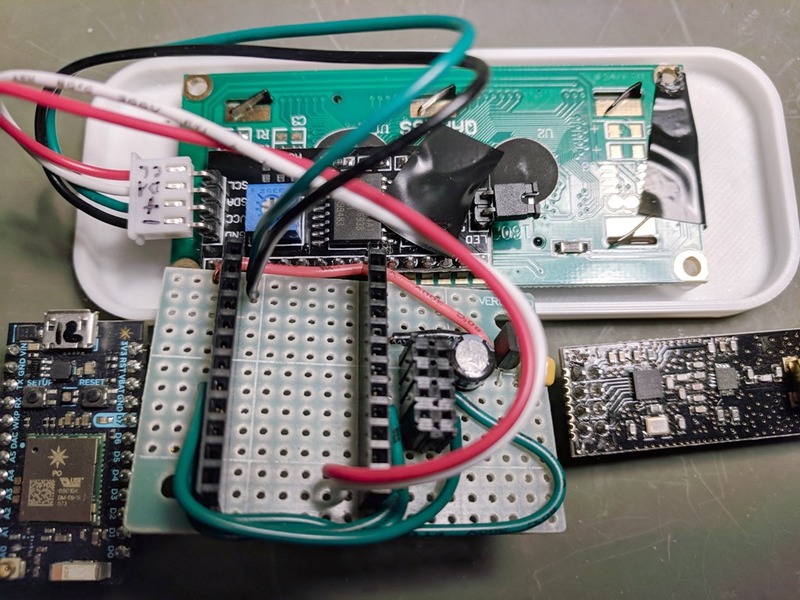 (It’s also a good idea to use that same radio on any remote sensors that are having trouble maintaining communication – it makes a big difference.) The display isn’t critical because I push the data to a web site where I can view pretty graphs and such, but it’s useful for troubleshooting. It continuously cycles through the temperature and supply voltage for each of the five remote sensors. The number in the lower right is the number of times the base station displayed stale data for a sensor (because it failed to receive a recent reading). That gives gives me a rough idea of whether I’ve got reception problems. The count of 129 is pretty low considering that’s been accumulating since the last time our household power blinked (several weeks). The display module is a standard 16×2 character LCD display I bought from Ebay plus an I2C LCD backpack I bought from Banggood. You could get something equivalent (though more expensive) from Sparkfun or Adafruit. I covered the end of the LCD and an LED on the backpack with black tape to reduce distracting light bleed. I designed the case in Fusion 360 and printed it on my 3D printer. It’s somewhat specific to the prototyping board I used, but you can get the design files from my GitHub repository. I don’t have a schematic or a PCB layout for the circuit board but it’s pretty simple so a description should suffice. The Particle Photon is powered from a micro-USB cable and we use the raw 5V pin on the Photon to power the display and the radio. The display is 5V-native, so that’s fine. The radio is actually 3.3V, and at first you might think you could power it from the Photon’s 3.3V pin (using the Photon’s onboard regulator), but after looking at the numbers I decided that the Photon’s 3.3V regulator wasn’t going to be able to power both the Photon itself and the radio (which can have high current spikes), so I actually ran the 5V line over to a separate 3.3V regulator (MCP1700-3302E/TO) and associated capacitors on the board and powered the radio that way. The code that runs on the Photon can be found in the GitHub repository. The correct connections between the Photon and the radio can be found in comments at the top of the code file (MOSI, MISO, and SCK). When I first started running this system I was forwarding events from the Particle cloud to my private Phant server, but SparkFun has since deprecated Phant so I switched to using a hosted virtual machine with ElasticSearch, Logstash, and Kibana (commonly known as the ELK stack). You could also use Adafruit.io, ThingSpeak, Blynk, or whatever platform you prefer. A while ago my team had code for our project spread out in two different Git repositories. Over time we realized that there was no good reason for this arrangement and was just a general hassle and source of friction, so we decided to combine our two repositories into one repository containing both halves of the code base, with each of the old repositories in its own subdirectory. However, we wanted to preserve all of the change history from each repo and have it available in the new repository. The good news is that Git makes this sort of thing very easy to do. Since a repository in Git is just a directed acyclic graph, it’s trivial to glue two graphs together and make one big graph. The bad news is that there are a few different ways to do it and some of them end up with a less desirable result (at least for our purposes) than others. For instance, do a web search on this subject and you’ll get a lot of information about git submodules or subtree merges, both of which are kind of complex and are designed for the situation where you’re trying to bring in source code from an external project or library and you want to bring in more changes from that project in the future, or ship your changes back to them. One side effect of this is that when you import the source code using a subtree merge all of the files show up as newly added files. You can see the history of commits for those files in aggregate (i.e. you can view the commits in the DAG) but if you try to view the history for a specific file in your sub-project all you’ll get is one commit for that file – the subtree merge. This is generally not a problem for the “import an external library” scenario but I was trying to do something different. I wanted to glue to repositories together and have them look as though they had always been one repository all along. I didn’t need the ability to extract changes and ship them back anywhere because my old repositories would be retired. Fortunately, after much research and trial-and-error it turned out that it’s actually very easy to do what I was trying to do and it requires just a couple of straightforward git commands. Add a remote to old repository OldA. Move all files into subdirectory OldA. Obviously you could instead merge old_b into old_a (which becomes the new combined repo) if you’d rather do that – modify the script to suit. This is the only non-obvious part of the whole operation. We’re doing a normal recursive merge here (the “-s recursive” part isn’t strictly necessary because that’s the default) but we’re passing an argument to the recursive merge that tells Git that we’ve renamed the target and that helps Git line them up correctly. This is not the same thing as the thing called a “subtree merge“. So, if you’re simply trying to merge two repositories together into one repository and make it look like it was that way all along, don’t mess with submodules or subtree merges. Just do a few regular, normal merges and you’ll have what you want. 338046 (4136) – exe\main.cpp:2925: > power policy saved. 338078 (4136) – exe\syspowertools.cpp:1018: ERROR: Cannot set the current power scheme to ‘8c5e7fda-e8bf-4a96-9a85-a6e23a8c635c’: The instance name passed was not recognized as valid by a WMI data provider. 338078 (4136) – exe\main.cpp:2942: ERROR: Can’t set high power state. 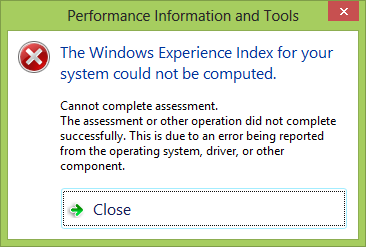 338078 (4136) – exe\processwinsaterror.cpp:0298: Unspecified error 29 occured. 338078 (4136) – exe\main.cpp:2987: > Power state restored. 338078 (4136) – exe\main.cpp:3002: > Successfully reenabled EMD. 338109 (4136) – exe\main.cpp:5341: > exit value = 29. Ah! This computer is used by my entire family and I had been using the Local Group Policy Editor to lock down some settings that I didn’t want people to change, including the power management policy. Apparently, if users can’t change the power management policy then WEI can’t change it either, and it gets grumpy about that. The solution was to turn off enforcement of the active power management plan, run WEI (which now worked fine), then re-enable enforcement. Failed to register URL "http://localhost:8080/" for site "MySite" application "/". Error description: Access is denied. (0x80070005). Launching Visual Studio with administrator credentials would cause it to be able to run the application successfully, but that kind of defeated the purpose of using IIS Express in the first place. 14> netsh http show urlacl | select-string "8080"
Now I can run my web app from VS without elevation. It’s incredibly frustrating that this still happens, but it turns out that if you have Visual Studio 2010 and SQL Server Express 2008 (or R2) on your machine, and you uninstall SQL Server Express 2008 and install SQL Server Express 2012 instead, you’ll get an error trying to load database projects in Visual Studio 2010: “Could not load file or assembly ‘Microsoft.SqlServer.Management.SqlParser’”. Why can’t SQL Server 2012 install the stuff it knows Visual Studio requires? Fine, whatever. You should be back to a working state.